Garmin and Volkswagen have teamed up to create Click & Ride, an integrated GPS system. The integrated GPS system has been designed to suite both new and used VW vehicles. 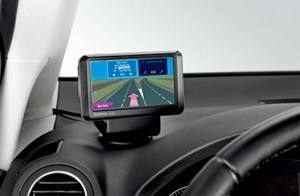 The system will has similar features of the Garmin Nuvi 7X5 Series portable navigation device. Featured with a 4.3-inch color touch screen, the device is also integrated with text-to-speech function, supports lane assist and traffic services with the ability to route around congestion. Moreover, it is connected to the vehicle audio system and power supply. To meet the strict GPS device placements laws, the GPS will mount in the lower driver’s side corner of the windshield. The installation of the mount results in a semi-permanent installation but it can easily remove without damage the vehicle. The price of the device is not yet announced but is estimated to cost about $400.